A History of local, senior representative cricket & first class matches hosted in the N E of Victoria, Australia. 1862 - The All England XI v an Ovens District side at Beechworth. two day game. 9th & 10th January. 1862 - England Tour of Australia. George Griffith of England V's Ovens. 11th January. 1877 - Early English Pioneer settler's to Wangaratta / Carragarmungeee were the Reid Family. The "Reidsdale" homestead / property is half way between Wangaratta & Tarrawingee on the Great Alpine Road on the Oven's River side of the road. 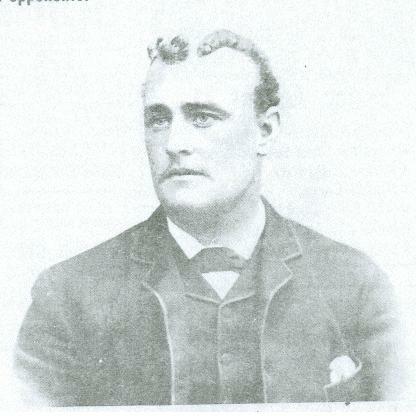 David Reid's youngest son, Curtis, went onto play in three inter - colonial matches for Victoria between 1869 -71. He was the first paid secretary of the Melbourne Cricket Club in 1877 at 250 pounds / year. He was also one of the umpires in the first test match ever played in Melbourne in 1877. Curtis was apparently the driving force in establishing the magnificent grandstand at the MCG in 1878. 1878 - Australian XI v North Eastern District of Victoria at Beechworth, 11th March & Day Two 12 March, 1878. 1879 - Mulwala, NSW, born cricketer, George "Joey" E. Palmer, son of New York born, David - a poundkeeper at Mulwala, makes his Test cricket debut against Lord Harris's English team at the M.C.G. Baddaginnie Community profile of - Joey Palmer. Benalla Family History Group profile of Joey Palmer. Australian Dictionary of biography profile of Joey Palmer. Cricinfo.com profile of - Joey Palmer. 1884 - Origins of the Ashes - Doubts have arisen about The Ashes being won in1882/83 because in the summary of Test results the 1882-83 record is given as England 2, Australia 2. The explanation how The Ashes were won from W. L. Murdoch's team which beat England, captained by A. N. Hornby, on that historic day, August 29, 1882, was given clearly in an interview with W. E. Bettesworth in 1894, when Ivo Bligh said: "Some verses were published in Punch to the effect that English cricket had been cremated at The Oval when Murdoch's team beat England and that 'St. Ivo' was taking a team to bring back 'The Ashes.' When we had beaten Murdoch's team the second time a number of Australian ladies presented me with a pretty little urn containing ashes, which, according to the title written on the urn, were 'The Ashes of English Cricket.' We played Murdoch's Australian XI three matches, winning two and losing one. A fourth match which was arranged to give two other men a chance ended in defeat." One of those ladies, Miss Florence Rose Morphy, of Beechworth, Victoria, married the Hon. Ivo Bligh in 1884, and after the death in 1927 of her husband, who became the eighth Earl Darnley in 1900, Lady Darnley gave the urn to the M.C.C. and the trophy was placed prominently in the pavilion long room at Lord's. Florence was the music teacher to the Clarke family and a companion to Sir William Clarke's wife, Lady Janet. Florence was the youngest daughter, born in August 1860, of John Stephen Elizabeth Anne Morphy. "Stephen" Murphy was the mining warden, district gold commissioner and police magistrate based at Beechworth, Victoria. He was Irish through and through, having come as an emigrant to Australia from County Kerry, Ireland. Ivo Francis Walter Bligh, 8th Earl of Darnley, DL (13 March 1859 in London – 10 April 1927 in Shorne, Kent), known earlier in his life as The Honourable Ivo Bligh, was a cricketer who captained the English team in the first ever Test series against Australia with the Ashes at stake in 1882/83. Later in life, he inherited the Earldom of Darnley and was elected an Irish representative peer. 1884 - A. Shaw's English Cricket Team v Benalla at the Garden's Oval, Benalla on 29th & 30th Dec, 1884. 1888 - G.F. Vernon's English Cricket Team v Benalla at the Garden's Oval, Benalla on the 2nd Feb, 1888. 1889 - A former captain of Port Melbourne first XI, Mr. Charles Murray Begg of Yea, use to display in his Yea "Sport's Emporium", the cricket ball used at Lord's in 1889 when Australia defeated England at Lord's, which was presented to him by the Australian wicket keeper, Mr. J. J. Kelly. Not sure of it's current whereabouts ? 1895 - Back in 1895 the only official cricket played in this area was under the North Eastern Cricket Association as a intra town competition, with Baddaginine, Beechworth, Benalla, Benalla Railway, Euroa & Wangaratta, playing for the "Sutherland Cup". See attached article, from The Argus Newspaper, in 1895. 1907 / 08 - Wangaratta v Fiji in Wangaratta on 15th January, 1908. First international match in Wangaratta. 1911 - An Myrtleford Cricket Association comprising Myrtleford, Whorouly, Gapsted, Buffalo Creek and the Rechabities club has been formed for the year 1911-1912. A trophy has been presented by Mr. A. Moore for the season's premiership. 1913 / 14 - Myrtleford & DCA - Grand Final - Whorouly C C V's Buffalo River C C - The 1913-14 Grand Final between Whorouly and Buffalo River, in Victoria, Australia, which was won by the latter side, but just happened to produce three world records for the game world-wide. According to the Guinness Book of Records, these extraordinary statistics remained the world record in cricket for over 75 years. They included the highest second wicket partnership ever of 641, a record that stood for 75 years, and was only beaten in 1988 by Sachin Tendulkar and Vinod Kambli in India*. Other remarkable statistics were the team score of 893, as well as the highest individual score of 408. Not surprisingly, these two records still stand today in the local grade cricket competition. On October, 31st, 2004 a re-enactment of the game took place with the teams comprising of descendants of the two original teams that played in that match in 1913-14, with some players coming from as far away as South Australia, New South Wales and Gippsland. The game was played at the Gapsted cricket ground, adjacent to the Great Alpine Road between Wangaratta and Myrtleford. Visitors were invited to travel to the ground in horse-drawn carts, vintage cars and to wear period costumes in the fashion of 1914. * It was in the Harris Shield Semi finals for Shardashram Vidyamandir (English) against St. Xavier’s (Fort) at the Azad Maidan in February 1988 that Sachin Tendulkar’s name first entered the record books. The score was 84 for 2 when the 14-year-old Sachin joined Vinod Kambli at the crease. They were not separated till the lunch break on the second day when the declaration finally came at 748 for 2—Sachin not out on 326 and Vinod on 349. Their unbroken partnership of 664 runs in 120 overs was a world record for any wicket in any game of organized cricket. The Sachin saga had begun. 1913 / 14 - Albury v New Zealand at the Albury Showgrounds, Saturday, 3rd, January, 1914. 1919 / 20 - Albury v Victoria at the Albury Sports Ground, Sunday, 8th February, 1920. 1920 / 21 - Albury & DCA v Marylebone CC (England) at the Albury Sports Ground, 4th & 5th March, 1921. 1920 / 21 - Benalla & DCA v Marylebone CC (England), captained by J.W.M.T. Douglas at the Benalla Gardens Oval, 7th & 8th March, 1921. 1925 / 26 - Albury v Western Australia at the Albury Sports Ground, Wednesday, 11th November, 1925. 1928 / 29 - Southern Districts of NSW v MCC (England) at the Goulburn Showgrounds, 25 & 26th Feb, 1929. Haydn Bunton opened the batting against Harold Larwood. He went onto play 25 games with the Fitzroy C.C. between 1930/31 & 1933/34 as well as a brillant football career with Fitzroy FC (3 Brownlows Medals) and Subiaco FC (3 Sandower Medals). 1933 / 34 - Albury & District - XV v NSW - XI at the Albury Sportsground, Friday, 22nd September, 1933. 1933 / 34 - Albury - XV v NSW - XI at the Albury Sportsground, Saturday, 23rd, September, 1933. 1934 / 35 - A North East Victorian side played NSW at the Benalla Gardens Oval, 10th & 11th December, 1934. 1935 - Attached to this link is a great article on former champion Albury sportsman, the great Hayden Bunton from The Argus Newspaper in 1935. 1936 / 37 - A "quest for bowlers" to select the best three bowlers in the North East was organised in Benalla by 3SR Radio on the 12th Feb, 1937 to play against England in March, 1937. 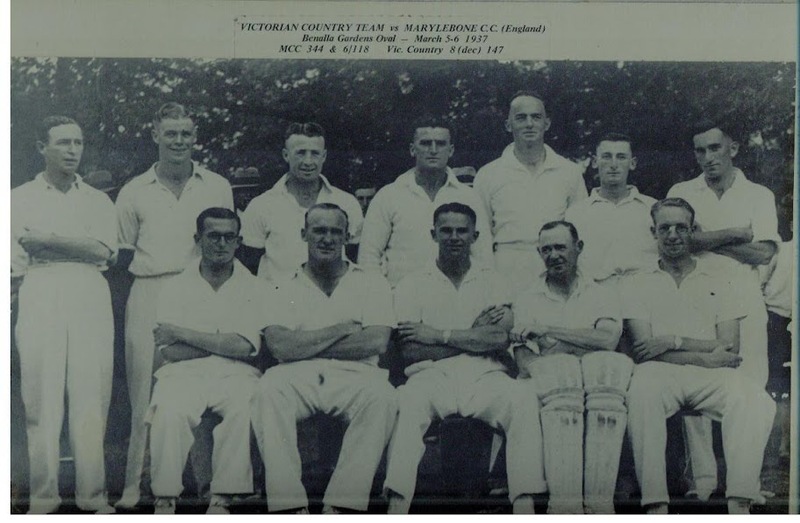 1936 / 37 - VCCL V's Marylebone C C (England), captained by G.O.B. Allen at Benalla Gardens Oval 5th & 6th March, 1937 in front of crowd of 12,700. VCCL Team v MCC in Benalla, 1937. BACK ROW – H Flood – Albury, Ken Kneebone – Wang, A Adams – Echuca, E Bourke – Numurkah, G Bennetts – Euroa, S Brown – Nathalia, A Davidson. FRONT ROW – A. McDonald – Camperdown, Charlie Heavey – Wang, J Walker – Benalla – Captain, W Castles – Benalla – V Captain, J Duff – Horsham. 1950/51 - VCCL v England at Memorial Oval, Euroa, 19th & 20th Feb, 1951. Click here to a preview from day one in The Age and day two in The Age newspaper. Article from - The Argus Newspaper, 12th June, 1953. 1953 - The original North Eastern District Cricket Cup Competition commenced with the establishment of the intra association senior cricket competition, the Benalla Ensign Cup. Keith Sherwill commences his long and outstanding administrative service to local cricket. 1954 - VCCL (North East) v Victoria at the Benalla Gardens Oval on Saturday, 13th March, 1954. 1958 - N E trial match to select a North East Victorian (VCCL) team to play England in February, 1959 in Wangaratta between a North Eastern Southern Zone & Northern Zone on 13th December. 1958/59 - VCCL v England match at the Wangaratta Showgrounds, 7th February, 1959. Back Row - Max Bussell - WDCA, Ray McArthur, Wal Mitchell, Clem Fisher - Team Manager, Malcom Warren - WDCA, Clive Kneebone - Katandra, Graham Bath. Front Row - Des Healy - Wodonga, Stan Treblecock - WDCA, Mac Holten - Captain - WDCA, Ray McLaine - Euroa, Des Johnstone - WDCA, Jock Thomlinson - WDCA. 1959 - Match Review from The Age newspaper of above match. 1959 - "English Bowlers in Car Accident". From The Age. 1962/63 - VCCL V's Marylebone C C (England) at Deakin Reserve, Shepparton on the 12th December, 1962. 1962/63 - NEDCCC v Riverina Cricket Council, at the Albury SG, on the 24th February, 1963. 1963 / 64 - VCCL v's South Africa at the Benalla Gardens Oval, Benalla, on the 18th December, 1963. 1965/66 - VCCL (North East) V Marylebone CC (England) at Euroa Memorial Oval on the 24th Nov, 1965. 1965/66 - NSW Country V Marylebone CC (England) at the Albury Sports Ground on the 20th December, 1965. 1967/68 - VCCL (North East) V Victoria at the Benalla Gardens Oval on the 18th November, 1967. 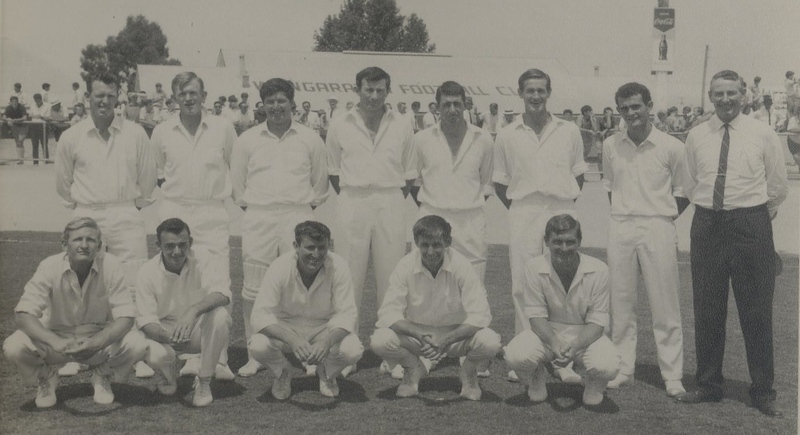 1968/69 - VCCL v West Indies at the Wangaratta Showgrounds on the 5th February, 1969. Kevin Hill - WDCA, John Cleary - Benalla, Geoff Welch - WDCA, Ken Stewart - Team Manager. Front Row - Brian Trewin - Benalla & DCA, Peter Negri - O & K , Terry Hogan - WDCA, Robin Kneebone - WDCA, John Romney - Upper Murray. 1970/71 - VCCL (North East) v MCC (England) at the Memorial Oval, Euroa , 20th January, 1971. Due to the abandoned 3rd Test in Melbourne, due to rain, it was announced that a 40-over match would be played on the last day of the Melbourne Test, the 5th January, 1971 and that an additional, 7th Test in Melbourne between 21st & 26th January would be inserted into the touring programme in place of the one-day game against the VCCL at Euroa and the four-day return match against Victoria at the MCG set down from the 22nd to the 25th January, 1971. 1971/72 - VCCL - U/21 (North East) v New Zealand at the Benalla Gardens Oval, 31st December, 1972. 1976/77 - VCCL (North East) v Western Australia at the Memorial Oval, Euroa, 26th January, 1977. 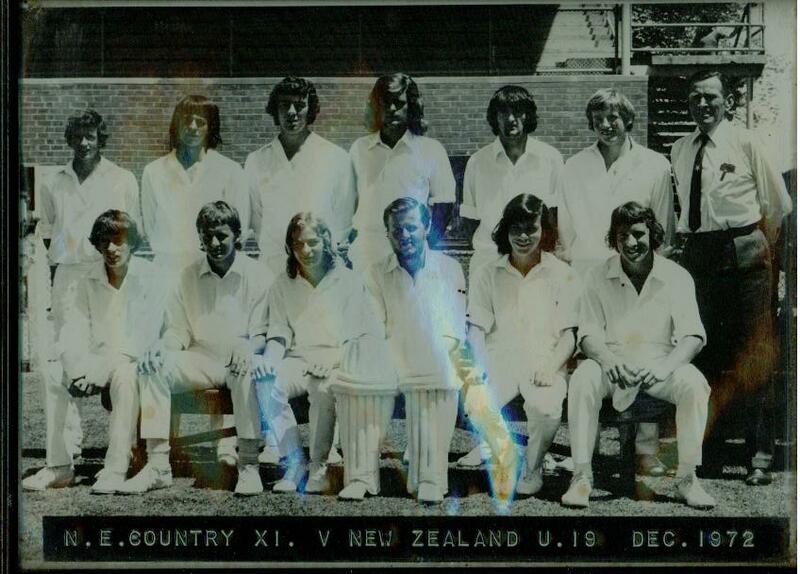 1977/78 - World Series Cricket - Country Cup - Australia v West Indies, at the Albury SG, 12th & 13th Dec, 1977. 1978/79 - WSC Cavaliers v WSC World XI, at the Albury Sports Ground, 27th & 28th January, 1979. 1980/81 - VCCL (North East) v Victorian XI at the Benalla Gardens Oval on the 27th & 28th September, 1980. 1982/83 - VCCL (North East) v New Zealand Emerging Players at the W J Findlay Oval, Wang, 9th-11th March, 1983. 1983/84 - VCCL (North East) v West Indies at the Benalla Gardens Oval on the 6th January, 1984. 1984 VCCL (North East) v West Indies at the Benalla Gardens Oval, Jan, 1984. Back Row – Keith Sherwill – VCCL, Viv Richards – W.I. 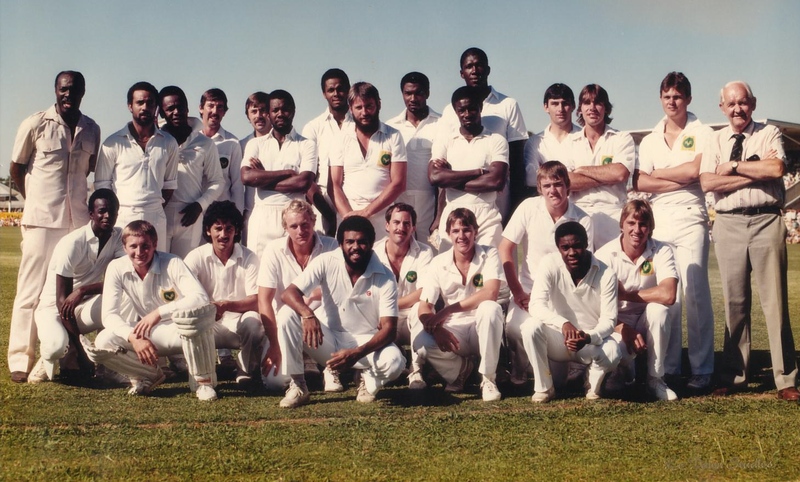 Captain, Eldine Baptiste, Wayne Daniel, Gus Logie, Jeff Dujon, Michael Holding, Joel Garner, Roger Harper, Richie Richardson, Desmond Haynes, Larry Gomes, Richard Gabriel, Graeme Turner, John Cleary – VCCL Team Manager. Front Row – John Stapleton, David Major, Brett McDonald, Gary Lidgerwood, Frances O’Brien – VCCL Captain, Peter Heinz – VCCL President, Greg Rosser, David Landon, Craig Edwards, David Halligan, Rudi Yonson, Denis Hill. 1984/85 - VCCL (North East) v ACT at the Albury Sports Ground, 11th & 12th November, 1984. 1984/85 - VCCL (North East) v West Indies at the Wangaratta Showgrounds on the 24th February, 1985. Back Row - Wes Hall - West Indies Manager, Jeff Dujon, Desmond Haynes, Francis O'Brien, Gary Lidgerwood - VCCL Captain, Malcom Marshall, Courtney Walsh, Brett McDonald, Roger Harper, Richie Richardson, Joel Garner, Greg Hoysted, Wayne McLennan, Darren Welch, Keith Sherwill - VCCL Manager. Front Row - Winston Davis, Rudi Yonson, Larry Gomes, Rodney Tomkins, Thelston Payne, Gavin Rixon, David Halligan, Rod Lane, Gus Logie, Peter Tossol. 1986/87 - Sheffield Shield - Victoria v Queensland at the Wangaratta Showgrounds on the 21st - 24th Nov, 1986. 1989/90 - Sheffield Shield - NSW v Victoria at the Lavington Sports Ground, on the 15th - 18th December, 1989. 1990/91 - NSW v England at the Lavington Sports Ground, on the 13th - 16th, January, 1991. 1991/92 - World Cup Match - England v Zimbabwe at the Lavington Sports Ground on the 18th March, 1992. 2006 - ING Cup - 2006 - ING Cup - Victoria v NSW 50 x over one day match at the Norm Minns Oval, Wangaratta, 2nd January, 2006. 2016 - Big Bash - Sydney Thunder v Melbourne Stars - 20/20 match at the Lavington Sports Oval on Tuesday, 12th December, 2016. 2007 - Big Bash - Sydney Thunder v Melbourne Stars - 20/20 match at the Lavington Sports Oval on Tuesday, 12th December, 2017. 1999 - Under the 1999 restructure of cricket throughout the State, known as the Victorian Cricket Pathway, North East Country was established as Region 6 of the 16 new regions – 8 in the Country and 8 in Melbourne and was the only VCCL Zone to not have it's boundaries extended by the Pathway restructure. To celebrate the opportunities that the Pathway provides junior players, an annual carnival is played between the North East and Northern Rivers Regional teams from Under 13, 15, 16 & 18 age groups on the second Sunday of November. The carnival, known as the Lightfoot/Sherwill Shield, is named after Bert Lightfoot (Shepparton) and Keith Sherwill (Benalla), who have served cricket in the area for over 60 years as players and administrators. The shield is awarded to the Region who wins the most games at the carnival each season. The North East Region covers 28,000 square kilometres with it’s boundary travelling through Corryong, Corowa, Violet Town and Alexandra/Eildon. @ - Curtis Alexander Reid - Early English Pioneer settler's to the Wangaratta / Carragarmungeee area were the Reid Family, settled at "Reidsdale" on the Great Alpine Rd, East Wangaratta. David Reid's youngest son, Curtis, went onto play in three inter - colonial matches for Victoria between 1869 -71. He was the first paid secretary of the Melbourne Cricket Club in 1877 at 250 pounds / year. He was also one of the umpires in the first test match ever played between Australia and England in Melbourne in 1877. Curtis was apparently the driving force in establishing the magnificent grandstand at the MCG in 1878. * - Harry "Bull" Houston Alexander - Moved to Euroa after his Test (1 match), Sheffield Shield (41 games) and Melbourne District cricket playing days with Essendon (89 games) & North Melbourne (4 games) ceased in the late 1930's and played a huge role in the development of cricket in Euroa over the following 50 years. Inductee of the Alexandra / Euroa & District CA Hall of Fame. # - Lea Kendall Hansen - Played much of his junior & senior cricket with the Corowa CC before playing 26 games with Footscray CC between 1993/94 and 2000/01 and the Victorian 2nd XI side. Represented the Australia A side v's India in in the USA in September 1999 in four ODI, whilst playing with the Canberra Comets. The Australia 'A' Squad was as follows - Adam Gilchrist (captain), Damien Martyn (vice-captain), Ryan Campbell, Brendan Creevey, Gerard Denton, Michael Di Venuto, Lea Hansen, Brad Hodge, Brett Lee, Shane Lee, Corey Richards, Andrew Symonds, Brad Young, Coach: Allan Border. They won the series 4 - 1. North East Knights - PATHWAYS PROGRAMS. Under the Pathway, the Region has 7 Development Squads – Under 14, 16 & 18 boys, Under 14, 16 and 18 girls and the Advanced Winter Coaching Program. A brief summary of the programs for each age group is available by clicking on the above Commonwealth Bank Pathways logo. Wangaratta & DCA player, Brody Riccardi pulls one away! (Pictures by Matthew Smithwick from the Border Mail newspaper). 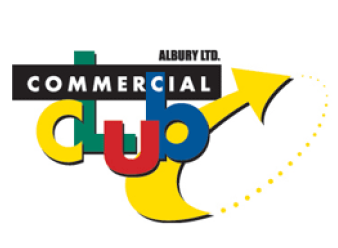 Albury & Border CA - 9 Clubs, 50 Junior Teams, 29 Senior Teams, 4 Milo Have-A-Go. Alexandra/Mansfield JCA - 4 Clubs, 8 Junior Teams, 0 Senior Teams, 2 Milo HAG. Euroa JCA - 4 Clubs, 4 Junior Teams, 0 Senior Teams, 1 Milo HAG. Rutherglen JCA - 4 Clubs, 5 Junior Teams, 0 Senior Teams, 1 Milo HAG. Wangaratta DCA - 13 Clubs, 30 Junior Teams, 34 Senior Teams, 6 Milo HAG. Wodonga DCA - 11 Clubs, 42 Junior Teams, 33 Senior Teams, 1 HAG. Yarrawonga DCA - 6 Clubs, 12 Junior Teams, 6 Senior Teams, 1 HAG. 150 Not Out - Cricket in Albury Wodonga. By Joe Wooding. 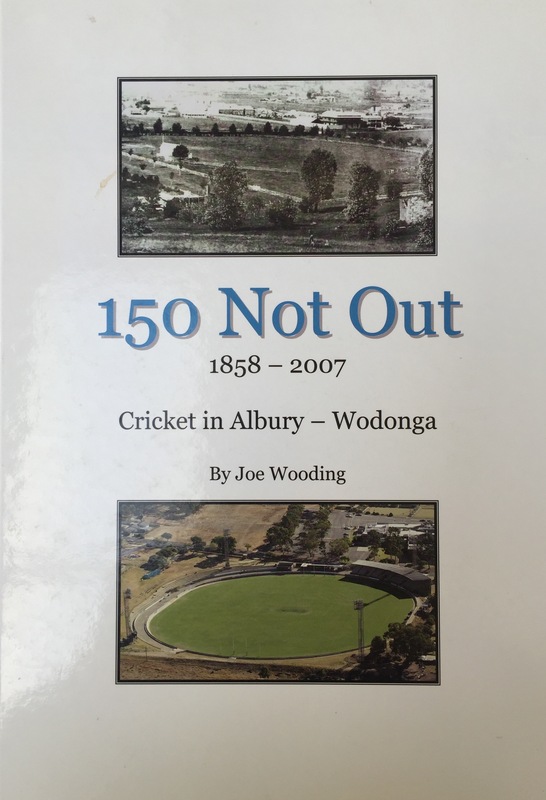 This excellent book on the history of Albury Wodonga cricket (printed in 2007) can be purchased from Books on Dean - Albury by clicking on the actual book above.